The Topre Realforce105UB keyboard, exclusively produced for The Keyboard Company in full 105 key German layout, is a joy to type on. It incorporates Topre's patented 30 million key life cycle non-contact electrostatic capacitance switches with a switch weight of 45g. The light gold on black keycaps with their tactile feel and N Key Rollover ensure fast and accurate input.. I have never owned any kind of professional keyboard, just an apple keyboard supplied with my iMac. Maybe my experience is not enough to properly evaluate different kind of switches or other more advanced keyboard concepts like the butterfly switch mechanism Apple uses on its own MacBook products. I have read a lot about switch designs in keyboards and I have heard about the Cherry MX switch line (who wouldn't have anyways), and I tried some different switches from cherry's switch line (blue red and brown, the green one I was not able to test because there was none available in the store I was looking for keyboards in; probably there are others too I'm currently not aware of). Then I have heard about the capacitive switch mechanism (or rather a more complex sensing algorithm enabled by a powerful microcontroller inside of the keyboard) that can dynamically adapt to the owner (carefully ignoring unintended keypresses when you just slightly touch the key). I'm quite surprised how well this thing works as it's very accurately senses the way I would type and it adapts to it., but probably its just a placebo effect because topre doesn't advertise this. But it's not just the switch paradigm which is different (not being a real switch but an electronic circuit), it's the a totally different feeling as well. It's not the type of clicky feel the cherry blue has, and it's not the linear feeling the cherry red has, it's rather a very distinct type of response composed of a slight initial resistance but then not a click, it's more a smooth wave ending in a damped sound called for (in my opinion legendary) Topre thock which makes typing very comfortable because it's not fatiguing the fingers, but it's not too linear either. 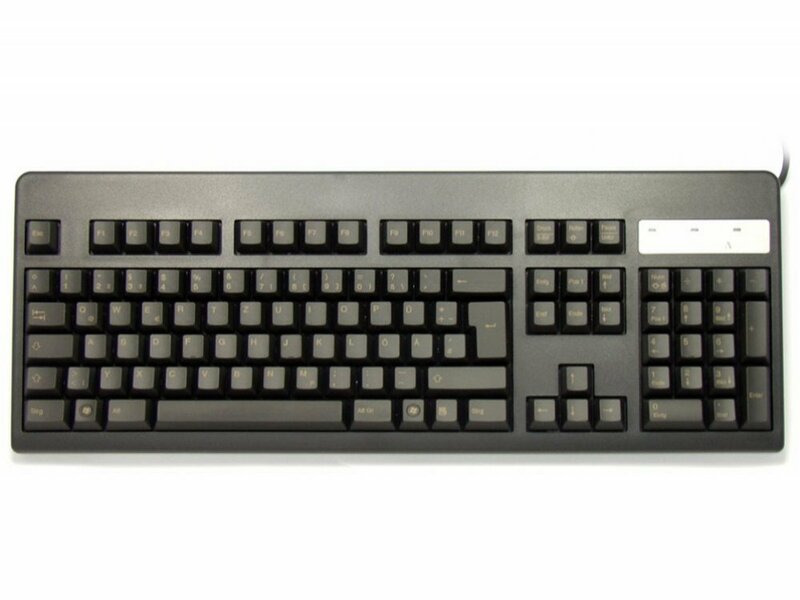 Some people would say that this kind of keyboard is inferior because it has rubber domes and springs under each key, but just because it's a rubber dome it hasn't to be a bad keyboard. The good combination of rubber dome and spring really enables this keyboard to give this kind of non-linear but as well non-clicky response. And additionally, it's relatively quiet compared to other keyboards I know about, including the Apple Keyboard i have been using for some years. It's as I have said above, the unique and indescribable Topre thock that I'd really miss if I had some other keyboard to work with. Of course, the quality of this keyboard is totally amazing. It's not made in china (hey, they do great products as well), but it's designed AND manufactured in Topre's own manufacturing facilities in Japan. It's quite heavy and it has a metal sheet in it, but that's exactly what makes this keyboard so long-lasting like others say. I feel like it could literally punch a hole in the wall without breaking it. I really love the keyboard because it's the first ever to make me feel like I'm playing some technically complex piece on a piano.